Welcome to everyone visiting this site from the Author, William Cross! Lordy! Tutankhamun's Patron As A Young Man. This is a study of the man who became with Howard Carter the co-discoverer of the greatest treasure of the 20th Century. This new book will be as controversial as The Life and Secrets of Almina Carnarvon, William's candid biography of Almina, 5th Countess of Carnarvon. George Edward Stanhope Molyneux Herbert, the 5th Earl of Carnarvon and husband to the Rothschild heiress, Almina Wombwell, was a multi-faceted character. Yachtsman, motoring pioneer, race-goer, horseracing stud establisher, crack shot, big game hunter – his interests were indulgent. Yet all these activities are dwarfed by Carnarvon’s finest hour: his unearthing, with archaeologist friend Howard Carter, of the ancient tomb of a boy king in Egypt; a discovery that captured imaginations worldwide. 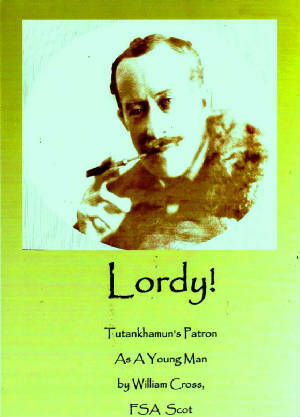 Tutankhamun’s tomb would have remained lost were it not for Lord Carnarvon, the project’s patron. “Lordy”, as he was named by the natives of the desert who were employed to dig and shift colossal sand dunes and debris, eagerly spent his wife’s money on several years of excavations in the Valley of the Kings, led by Carter. How excited he was, then, following the events of 4 November 1922 when the army of diggers uncovered a stone staircase leading down to a lost treasure. The rest is a well-known fable, with Carnarvon dying soon after the opening of the tomb – the victim of an ancient curse, according to many. In this controversial retrospective on the 5th Earl, William Cross ( biographer of Lady Carnarvon) offers a portrait of his very early days within a family saga, based on diaries and correspondence of the 4th Earl, Lordy’s father. Here, is Lord Carnarvon in a fresh light, one that has hitherto been buried as deep as the entrance to Tutankhamun’s tomb. The book contains a thought provoking introduction by an American psychologist who examines Lord Carnarvon and Howard Carter, as men. 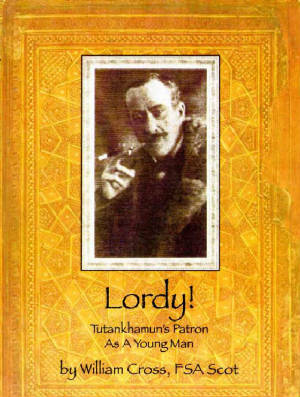 The book's Epilogue later confronts aspects of Lord Carnarvon's personal relationships and includes new and important disclosures about the Earl's death in Cairo in 1923. Suffice to say is that Lord Carnarvon did not die from a mosquito bite. Please get in touch to offer comments or obtain additional information.